I guess it's the small town girl in me, but there are times when I need to get away from the smell and sounds of the city and just feel the grass under my feet. Dublin is gritty and grimy but it actually has a surprising number of green spaces, some of them not so obvious. There's Phoenix Park, which is HUGE. I mean, like seriously huge, and is full of deer. Urban deer! In the middle of the city! 1) (From the local greengrocer -- again, small town girl, can't help chattin' when I comes across folks). A guy died there, and nobody found him for TWO YEARS. Big, huh? 2) A chef who is a friend of a a chef who knows the chef where my roomie works (do try to keep up) apparently knows someone who knows someone who is onto something with the city council and gets free organic venison on the sly. Man, I wonder if it tastes anything like the bottled moose my Mom makes. 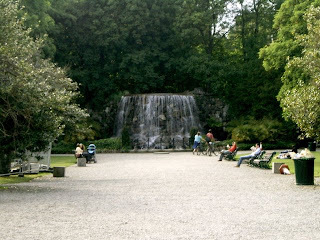 However, for a combination of down-townness, and gorgeousness I've gotta say my favourite of all the parks in Dublin is the Iveagh Gardens. Which you may see on your left, although the pic doesn't do the gardens justice. I make a point of going there when I'm in the college library, bypassing the more convenient Merrion Square with the Oscar Wilde statue and the much-frequented Stephen's Green. There are two ways in, both pretty subtle, and I generally go through the tiny door behind the National Concert Hall, which takes you past their recycling and general detritus, all of which makes the lovely greenness of the gardens even better. Like a real secret garden. There are wild areas with brambles (note to self: are city berries safe to eat?) and birds and on a rather gloomy overcast day such as I enjoyed on my recent foray, very few people. On another note, I might have to find a new place to live. I actually like the flat, although it's not very big, and I'm getting on just fine with Bepe, mostly because our hours are so different and we don't actually meet up that much. It's the girlfriend. I hate her. Example in point: Yesterday, I came home to find that she had moved my not-yet-dry laundry off the balcony to hang up HER stuff. Which comprises, of course, her teeny-tiny Italian underwear. "I hope you don't mind," she said. "I can fit so much more on the dryer, because MY underwear is so much SMALLER than yours." I did mind, but that just flabbergasted me so much I was left without words. Is she planning to be around much? Because if she is, I've just got to go. I've never even had a conversation with the girl but that's enough. There's a month to go but my sister is already trying to micro-manage her trip and get me in on the act. I don't know what I'm going to do with the brother-in-law. Let's call him "Jock". Do they play ice hockey here?